Here's a selection of 'envelope' cards that I've been making from the Figgy Pudding kit that Jo at Scrappydo's sent for me to play with ! The ribbons I used were from Lianne @ Little Silver Hat ... Talking of LSH (little silver hat) - wait until you see their December kit .. .if you have a spare minute have a look at this months kit - it is without doubt one of the lushest blingiest christmas kits ever ! 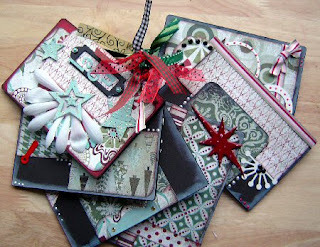 I also made the XMAS wall hanging and altered a Kaizer wood tag book using the Figgy Pudding. 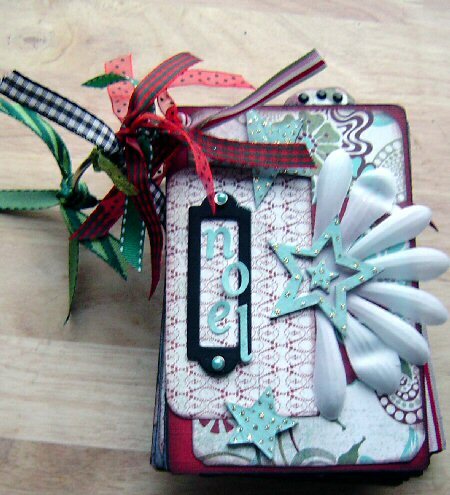 The Basic Grey chipboard and stickers are fabulous to use, and save so much time in covering, sanding and inking. My boy hit 12 on Thursday. I know I keep saying this, but where is the time going ? I'm missing some of his years ... did I blink and someone stole a couple of years from me ?? Well if they did, I want them back. I am nowhere near ready. No sirree, not even close to getting ready. I have Aaron's main present, my mums more or less sorted, and thats it. I'm going to cop out this year, and send money/vouchers to the kids I normally buy for. I'll make them a nice card for it to go in though ... dya think that will easy my conscience ??!!!!! LOL !